Everyone else, get comfy, grab a brew and I'll show you what I've been making recently! First up was another lever arch file cover with some no drama llama EPP appliqué! 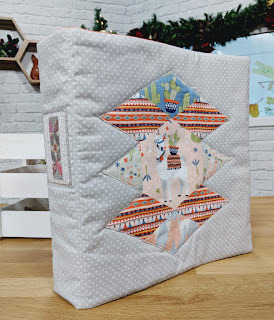 I spent some time designing a pattern for the pieces that worked well with the fabric, the Llama Llama fat quarter bundle, for a demo on Sewing Quarter. 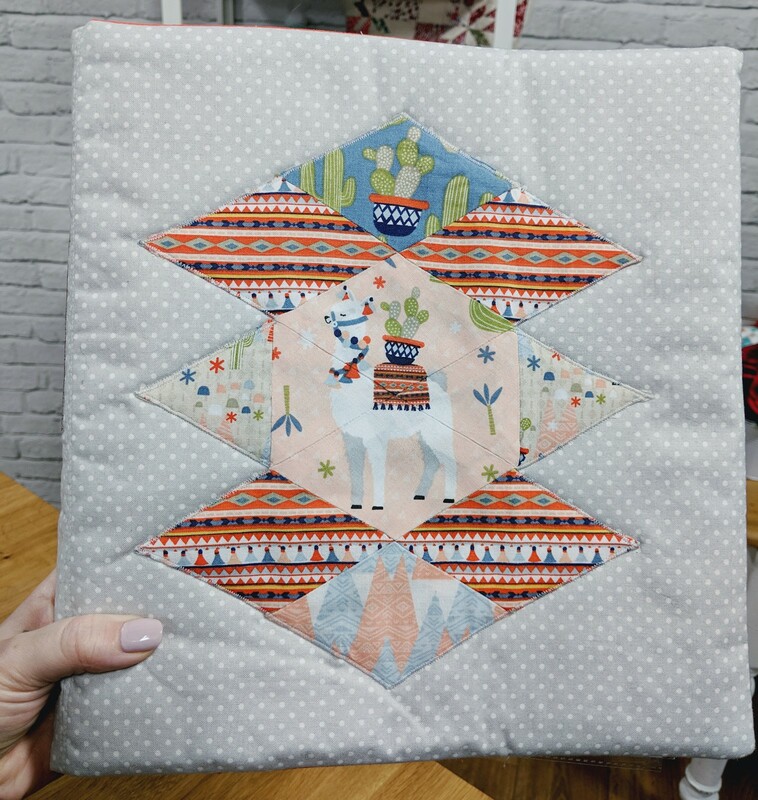 I also decided to fussy cut the pieces making up the focal llama. Yes I could have used one big hexagon but I like to challenge myself a bit and it was for a small make, not sure I would do this if it was for a quilt because it's obviously more time consuming. 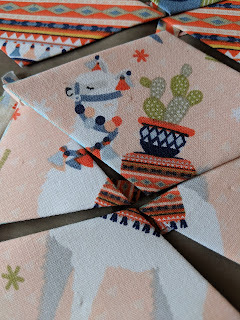 The great thing about using small pieces of epp like this is that you can use them for decoration and the apppliqué is really easy because the edges are already folded under. You can simple top stitch it in place or use any decorative stitch you like, I went for a small zig zag. The file covers are so fun to make and are great gifts. I also like anything that lets me combine my love of stationery and sewing! 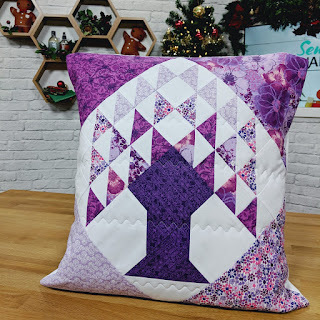 I also made my Tree of Life quilt block into a cushion, using the Purple Mist fat quarter bundle. 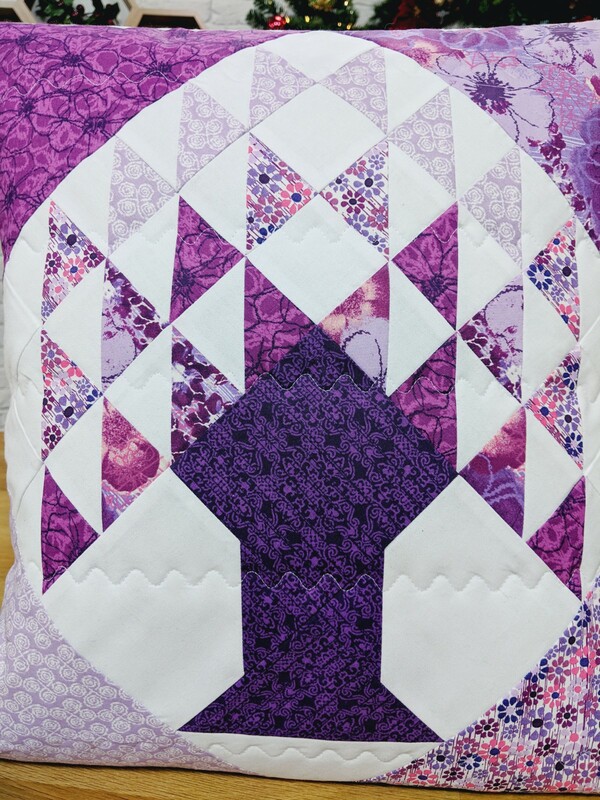 The finished 14" block is set on point with side setting triangles. I tend to always cut these larger and then trim them back. It might waste a tiny bit of fabric but it's easier to be more accurate that way and you don't have to worry about the bias edges too much. There are lots of half square triangles (hsts) in this block but the cutting is much quicker with the Creative Grids Multi Size 45°/90° Triangle ruler. It also means you can sew them together quickly and with more accuracy. I use the ruler whenever I have to make lots of hsts, I definitely recommend it. For the quilting I used a fun wavy decorative stitch on my Elna 680 machine (mode 2 #1). 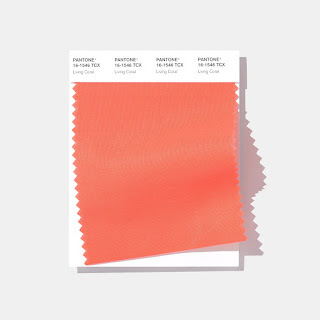 This week Pantone announced the colour of the year for 2019, Living Coral. I absolutely love it, it's such a warm and lighthearted colour. My favourite colours are pink and orange and in the past couple of years I've found myself buying lots of peach and coral fabric, it's a lovely mix of the two. I am hoping this means they'll be even more coral fabric available and coral everything because the colour makes me very happy! Our local library reopened recently, after some renovations, and I am delighted to be getting back into reading. Books have always been a great way for me to escape, immersing myself in a story and also as a way to learn more or think about things differently. I admit to being a fan of business and self help books, I go through phases of reading them (not all of them, I'm kind of picky) and I have to be in the right mood. 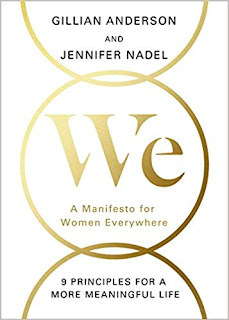 This is one of the books I borrowed, We: A Manifesto for Women Everywhere by Gillian Anderson and Jennifer Nadel, so far I'm enjoying it (and yes it is that Gillian Anderson). It has a gentle, conversational approach with anecdotes and exercises. I also borrowed a fiction book, Clock Dance by Anne Tyler. A few years ago I read a couple of her books and enjoyed them so I'm looking forward to this one. If you have a favourite title of hers please let me know, I like recommendations! The staff at Patchfinders had a get together this week and we learnt to make fabric lanterns. Our teacher Lil was great - she will be teaching a class at the shop in the new year - and we had such a fun time. A huge thank you to Claire for organising such a wonderful evening! 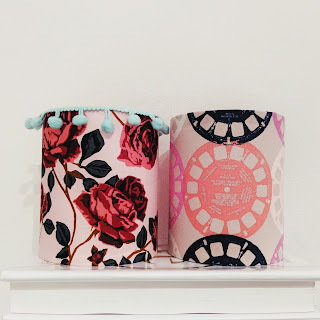 I chose two of my favourite prints, Social Climber from Floral Retrospective by Anna Maria Horner and the Viewfinders by Melody Miller. There is no point keeping fabric treasures tucked away and I love that I'm going to be able to see these beautiful prints in my living room. Judith very kindly let me use some of her pom pom trim to embellish my floral lantern. I think it's so kitsch and granny looking but still modern - so my taste! And lit up with battery fairy lights inside, they are so pretty! Very hard to capture but you get a sense of it here. The one on the right isn't quite finished, I still need to tuck the seam on the inside. I began using beeswax when I started doing English Paper Piecing, I was given a small piece to run thread through. It helps prevent knots, allows for smooth sewing and strengthens the thread. After I started using Aurifil for EPP, I found I didn't need the beeswax and subsequently lost that small piece somewhere. At a local market I discovered Foz-Bees, a Manchester bee keeper who has the most amazing products and delicious honey. 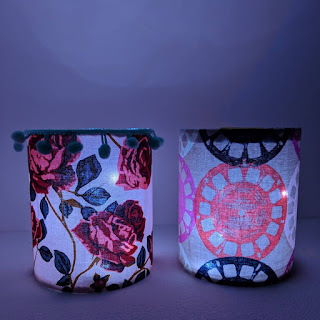 The beeswax blocks called out to me and I thought it would be fun to try it with other threads, I have heard it works well for those sometimes pesky metallics! I'm wondering if I can use it on embroidery thread (if any one has please let me know your experience!) and fine thread like the Aurifil 80wt that I use for appliqué. I'm always keen to try new and old techniques, especially when it's with natural resources - even better when you can shop small. I picked up some extra and am giving away this 100% natural beeswax block and bee. The clouding you see on it is because I've been keeping it in the fridge! Due to the fact that it's fairly delicate, could possibly melt if it was near a heater, postage costs are crazy, and I'm not certain of international restrictions on this sort of thing: I am only offering the giveaway to UK readers. *GIVEAWAY NOW CLOSED* Congratulations to the winner, Kay! Just leave a comment below - if you're stuck for something to write, tell me your favourite way to eat honey! Mine would be in porridge or to just eat a teaspoon of it! If you don't want to sign in to a profile please leave your email in the comment, e.g. ilovebees (at) honeycomb dot com so that I can contact you. UK entries only, the winner will be chosen on Monday 10th December. Good luck! I love honey and lemon in hot water. I know most people only have that when they have a sore throat, but I have it whenever I'm in need of comfort. I tend to only have it then but am starting to think it's a perfect wintery drink! My dad keeps bees and produces the most lovely honey, although I've not a clue what he does with the wax! Maybe he will be able to replace it! How wonderful that your Dad keeps bees and I bet the honey tastes great! I love honey with frozen summer fruits a d Greek yoghurt, far more healthier than sugar! how lovely! 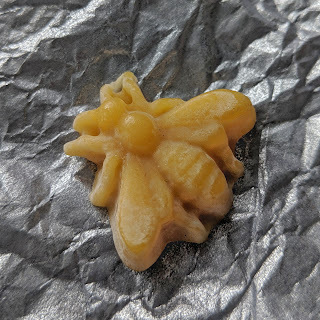 I wonder if it was pure beeswax or mixed with something else, I might try to research that! What a great find! Perhaps now is not the time to say that I don't like honey?!! The little bee is so sweet. My favourite way to have honey is in a hot drink, I start of most wintery days with the juice of half a lemon inn hot water with a spoon of honey. Thank you for lovely giveaway. Thank you Kay! I'm going to start the day with that too, I think there are health benefits and it sounds very soothing! We take bees for granted - what wonderful creatures, and now useful to quilters too! Very true and they are so important! I've never tried it in tea! Love honey, either on toast or just bread and butter. So love your post today...lots of goodness....love the pillow and cover. Lovely post, as always. 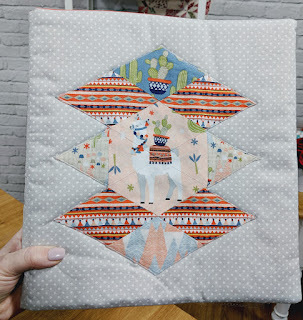 Gorgeous Tree of Life cushion and also loving the fussy cut llamas! 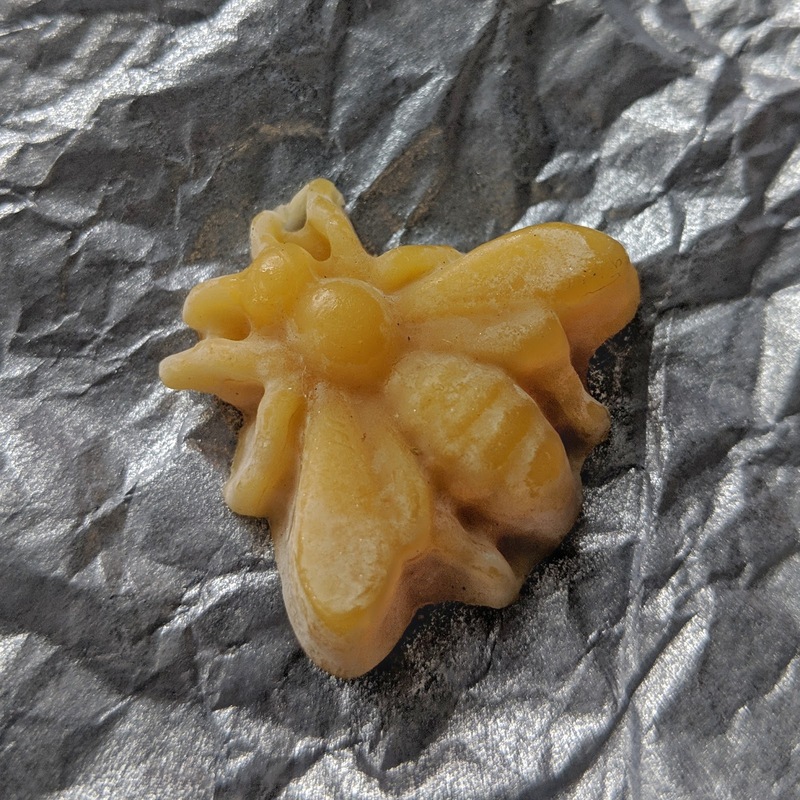 Have used beeswax in the past but not tried it on embroidery thread. I'll use honey if cooking but not keen on eating it even though I know it is good for you. 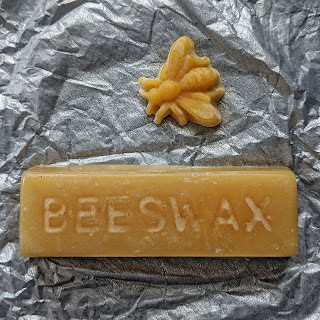 My wife would love the beeswax for her various projects!!! I love honey in porridge and spread on hot, buttered toast! Honey on hot buttered crumpets. Love your lever arch cover. I have the pattern and will be making one.